April 29 marked the 100th day of Donald Trump’s presidency. Depending on who is doing the grading, his progress report is mixed, but one area has performed better than expected (or, from his critics, feared). The market indices concluded the first quarter on an upbeat note. The Dow gained nearly 5 percent during the three months of the year, while the Nasdaq marked its best quarter since late 2013 with a 10 percent increase. During the first quarter, the Dow crossed the 20,000 and 21,000 benchmarks for the first time. Not that there haven’t been market setbacks. In March, the market experienced an eight-day losing streak following the failure of the president to as yet achieve one of his signature campaign pledges to repeal and replace the Affordable Care Act. In the first two weeks of April there was further flattening of the market on escalating tensions with North Korea, and the U.S. airstrike against Syria. So it is not surprising that when Spectrem Group asked Affluent investors to cite the primary factor that is most affecting their current investment plans, the largest percentage said, “Stock Market Conditions.” Thirty-three percent cited this factor, up from 28 percent in January 2017 when this question was last asked. Fourteen percent of Affluent investors said that “Retirement” is the primary factor most affecting their current investment plans. This is basically unchanged from January, but down from 20 percent in October 2016. Eight percent cited the “Economic environment,” down from 10 percent three months ago. Seven percent responded, “The political environment,” down from 10 percent in January, while just six percent said, “Household income,” also down from 10 percent three months ago. The focus on Stock Market Conditions, historically in relation to the Spectrem Affluent Investor Confidence Index®, has been heightened in times of market volatility. 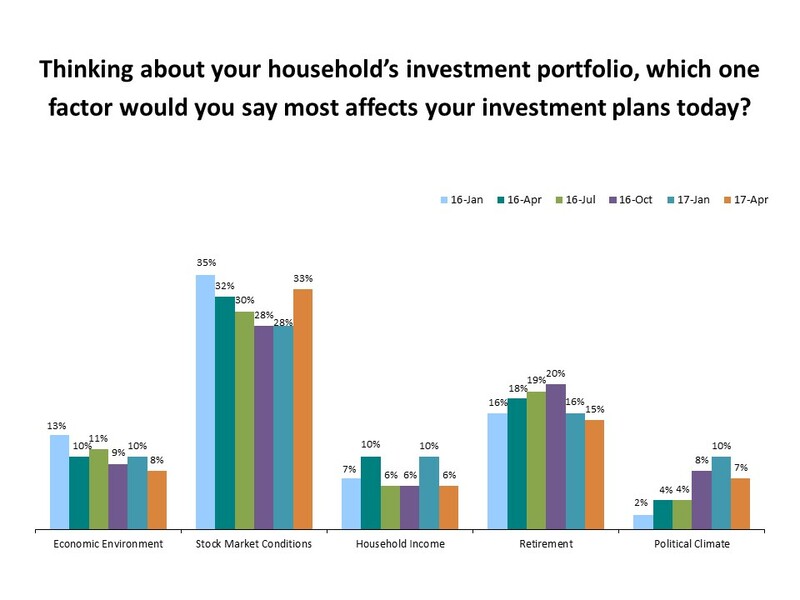 In January 2017, for example, 35 percent of Affluent investors cited this factor as the one most affecting their investment plans at a time when U.S. stocks suffered the worst 10-day start ever to a calendar year. Thirty-eight percent responded similarly in October 2014, just prior to the mid-term elections that would see a power shift to the Republican Party and a month of market volatility. The market’s so-called Trump rally regained strength at month’s end on positive earning reports and the first-round results of France’s presidential election. The Dow was on track for its first consecutive 100-point gains since Jan 24-35, when it topped 20,000 for the first time, USA TODAY reported.